Learn how to house and fence your goats on the small farm. Goats, whether raised for meat or milk, need basic protection from the elements: snow, wind, rain, heat. They also are notorious for getting out of enclosures, so you'll need some seriously tight fencing for them. That said, goat shelter doesn't need to be elaborate. A hoop house can provide enough shelter for goats. And during the grazing season, trees or windbreaks, a three-sided shed, or a pole barn with just a roof may be enough for your goats. Just keeping them out of drafts is enough. If you are kidding in the winter, you will typically need a solid building for your pregnant and/or lactating does and the kids. Inside the building, you can use livestock panels to divide the space into separate pens for each group of does and kids. If you're creating goat housing, consider where you will store feed, straw or other bedding, and other goat-related equipment. Also leave space for feeders and waterers, which will keep things cleaner and prevent wasting of feed. All animals should be able to eat or drink at one time. 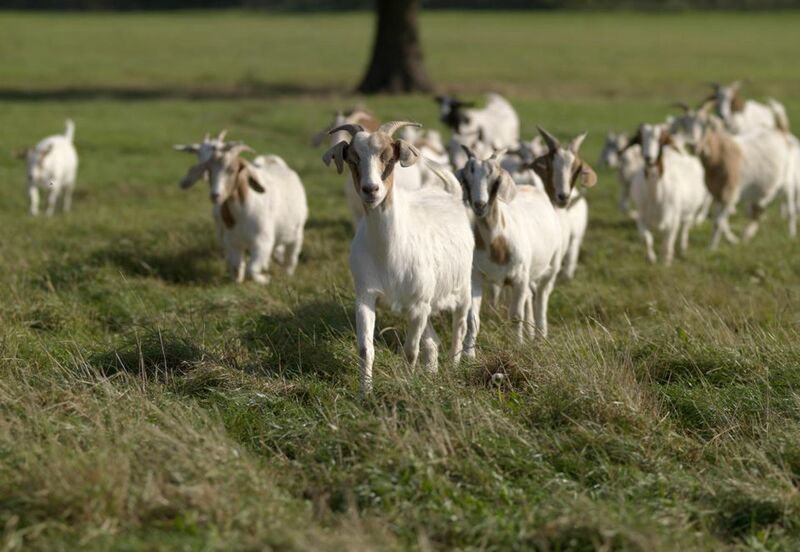 If your goats will have access to a lot of woods, pasture, and other range areas, you will need 10 to 15 square feet per goat indoors for sleeping space. If not, you'll need about 20 square feet per goat for sleeping space and 30 square feet for exercise (ideally, this would be outdoors). Each adult goat needs at least a 4-foot by 5-foot kidding pen, so consider this space in your goat shelter depending on how many does you will breed at one time. You can have different does kid at different times in the same pen if you clean and sanitize the pen between kiddings. Fencing is key to the safety and health of your goats, your other animals, and the integrity of your possessions! Fencing for goats needs to be secure, not just to keep them in, but to keep predators - foxes, bears, dogs, coyotes, and more - out. You will need perimeter fencing around the entire goat area or your property boundary, and then cross fencing within the goat area to keep goats separated from each other (this can be temporary or permanent). Temporary fencing. Temporary fencing is meant to keep bucks away from does and weaned kids from does. This can be poly tape or wire, electric netting, or high-tensile electric wire. If using high-tensile wire, you'll need five to seven strands of wire spaced about 6 inches apart on the bottom and a bit more for the top wires (8 to 10 inches). Permanent fencing. Permanent fencing can also be constructed of high-tensile wire, but if your goal is to keep out smaller predators like foxes, they can easily crawl under a six-inch-high wire. Woven wire fencing is a better bet for perimeter fencing. A strand of electric or barbed wire at the top will help keep goats in and more predators out.